Arthritis is inflammation or degeneration of one or more joints. A joint is the area where 2 bones meet. There are more than 100 different types of arthritis. 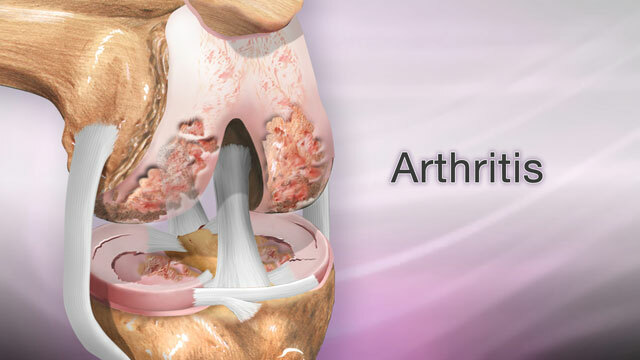 Arthritis involves the breakdown of cartilage. 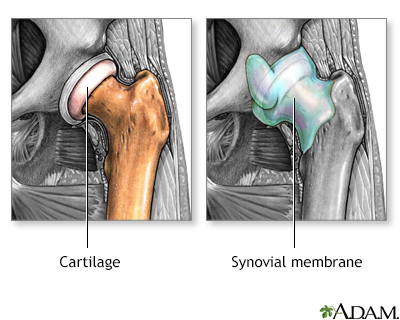 Normal cartilage protects a joint and allows it to move smoothly. Cartilage also absorbs shock when pressure is placed on the joint, such as when you walk. Without the normal amount of cartilage, the bones under the cartilage become damaged and rub together. This causes swelling (inflammation), and stiffness. In most cases, the joint inflammation goes away after the cause goes away or is treated. Sometimes, it does not. When this happens, you have long-term (chronic) arthritis. Arthritis may occur in men or women. Osteoarthritis is the most common type. The provider may also remove a sample of joint fluid with a needle and send it to a lab to be checked for inflammation crystals or infection. Low-impact aerobic activity (also called endurance exercise). Walking is a good example. Range of motion exercises for flexibility. Strength training for muscle tone. Eat foods rich in omega-3 fatty acids, such as cold-water fish (salmon, mackerel, and herring), flaxseed, rapeseed (canola) oil, soybeans, soybean oil, pumpkin seeds, and walnuts. Use a cane to reduce pain from hip, knee, ankle, or foot arthritis. Acetaminophen (Tylenol) is often the first medicine tried to reduce pain. Take up to 3,000 mg a day (2 arthritis-strength Tylenol every 8 hours). To prevent damage to your liver, do not take more than the recommended dose. Since multiple medicines are available without a prescription that also contain acetaminophen, you will need to include them in the 3,000 mg per day maximum. Also, avoid alcohol when taking acetaminophen. Corticosteroids ("steroids") help reduce inflammation. They may be injected into painful joints or given by mouth. Disease-modifying anti-rheumatic drugs (DMARDs) are used to treat autoimmune arthritis. They include methotrexate, sulfasalazine, hydroxychloroquine, and leflunomide. Biologics are used for the treatment of autoimmune arthritis especially rheumatoid arthritis (RA). They include etanercept (Enbrel), infliximab (Remicade), adalimumab (Humira), abatacept (Orencia), rituximab (Rituxan), golimumab (Simponi), certolizumab (Cimzia), and tocilizumab (Actemra). These drugs can improve the quality of life for many people, but can have serious side effects. Other drugs for RA -- Janus kinase inhibitor: Tofacitinib (Xeljanz). This is a medicine taken by mouth that is now approved for treating RA. For gout, allopurinol (Zyloprim), febuxostat (Uloric) or probenecid (Benemid) may be used to lower uric acid. For osteoarthritis of the knee, injections of steroids (Kenalog) or hyaluronic acid (Synvisc) may provide short-term pain relief. A knee brace may also help. It is very important to take your medicines as directed by your provider. If you are having problems doing so (for example, because of side effects), you should talk to your provider. Also make sure your provider knows about your all the medicines you are taking, including vitamins and supplements bought without a prescription. A few arthritis-related disorders can be completely cured with proper treatment. 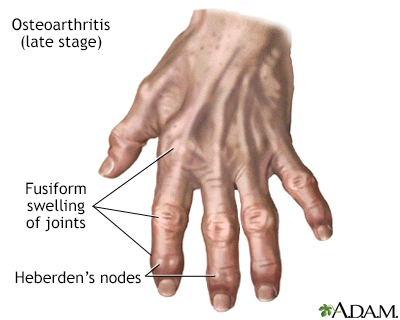 Most forms of arthritis however are long-term (chronic) conditions. Your joint pain persists beyond 3 days. You have severe unexplained joint pain. The affected joint is significantly swollen. You have a hard time moving the joint. Your skin around the joint is red or hot to the touch. You have a fever or have lost weight unintentionally. Early diagnosis and treatment can help prevent joint damage. If you have a family history of arthritis, tell your provider, even if you do not have joint pain. Avoiding excessive, repeated motions may help protect you against osteoarthritis. Kavanaugh A, Grevich SC. Rheumatoid arthritis. In: Kellerman RD, Bope ET, eds. Conn's Current Therapy 2018. Philadelphia, PA: Elsevier; 2018:899-903. Khanna D, Khanna PP, Fitzgerald JD, et al. 2012 American College of Rheumatology guidelines for management of gout. Part 2: therapy and anti-inflammatory prophylaxis of acute gouty arthritis. Arthritis Care Res (Hoboken). 2012;64(10):1447-1461. PMID: 23024029 www.ncbi.nlm.nih.gov/pubmed/23024029. Neogi T, Felson D. Osteoarthritis and rheumatoid arthritis. In: McMahon SB, Koltzenburg M, Tracey I, Turk DC, eds. Wall and Melzack's Textbook of Pain. 6th ed. Philadelphia, PA: Elsevier Saunders; 2013:chap 47. Neustadt DH. Osteoarthritis. In: Kellerman RD, Bope ET, eds. Conn's Current Therapy 2018. Philadelphia, PA: Elsevier; 2018:886-890. Singh JA, Furst DE, Bharat A, et al. 2012 update of the 2008 American College of Rheumatology recommendations for the use of disease-modifying antirheumatic drugs and biologic agents in the treatment of rheumatoid arthritis. Arthritis Care Res (Hoboken). 2012;64(5):625-639. PMID: 22473917 www.ncbi.nlm.nih.gov/pubmed/22473917.